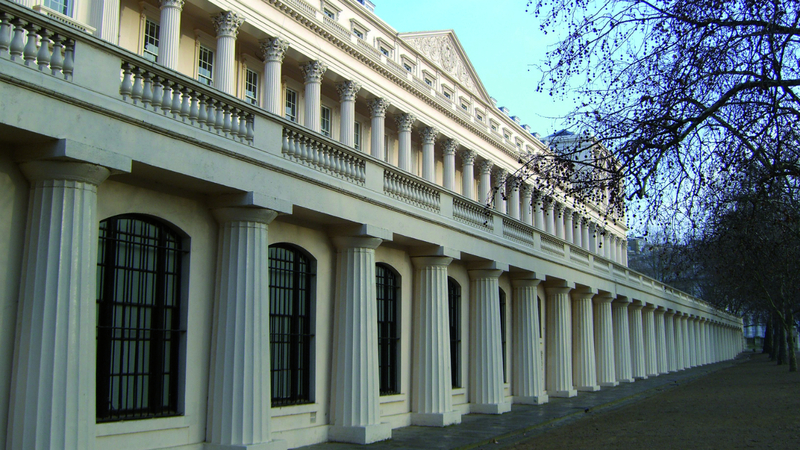 The Grade I listed Carlton House Terrace is a six-storey stucco rendered building in central London. The freehold belongs to the Crown Estate. Classical in style, complete with Corinthian columns, it dates from 1827-32 and was designed by celebrated architect John Nash. Its historic fabric includes mahogany floorboards, marquetry inlay, hand-painted walls, cabinetry and chandeliers. In line with the guidelines set out by the Crown Estate and English Heritage, we have worked with four international designers to create a series of modern residential apartments within this historic setting. We helped design living spaces that work around Nash's cantilevered staircases, banqueting rooms and portrait-viewing hallways. Permission has to be obtained for every procedure. We have formulated a conservation package that includes the replacement of shattered cast iron beams. Masonry floors have been strengthened to take the weight of sound equipment, marble bathrooms and comfort heating. Roof timbers have been replaced but the period structure maintained. The period features of London’s Grade I listed Carlton House Terrace have been maintained but the building has become a series of 21st century apartments and four family townhouses with state-of-the-art, discretely integrated building services. The Crown Estate, Westminster City Council and English Heritage all imposed strict requirements on this residential conversion. Passive rather than mechanical systems have been encouraged. The Victorian materials and high ceilings and windows provide natural cooling. Investigations into an innovative aquifer cooling system were carried out but not considered feasible. Spatial modelling enabled services to be integrated into the existing fabric with minimal disruption. The ventilation is hidden in the roof structure and is invisible to neighbouring tall buildings. The ductwork has been set behind cornices, existing architecture, chimneys and staircases. VESTA smoke alarms, which have no visible smoke detectors, have been installed. Technically advanced LCD screens are used to control heating, ventilation, air-conditioning, audio-visual and communication systems from one point. The basement houses the new swimming pool: mechanical plant has been fitted into the void under the pool at the shallow end to minimise excavation.